U.S. customers, starting in May, will have access to Ally's lease and retail finance program at Aston Martin's 37 dealerships for all core sports cars. NEW YORK (Bloomberg) -- Aston Martin Lagonda Ltd. named Ally Financial Inc., the former GM financing arm, as its preferred U.S. auto lender to help the maker of luxury sports cars expand sales. Starting in late May, U.S. customers will have access to Detroit-based Ally’s lease and retail finance program at Aston Martin’s 37 dealerships for all core sports cars, the automaker said in a statement. Aston Martin, the only global luxury-auto brand not part of a larger group, is trying to boost sales to be more competitive. The 102-year-old maker of sports cars featured in James Bond films has been raising money for research and new-model development. Daimler AG supplies Aston Martin with engines and electronics and in August said it boosted its stake in company to 5 percent. Aston Martin said Thursday that it received a 200 million-pound ($305 million) investment to fund the production of its first crossover, the all-wheel-drive DBX model. The Gaydon, U.K.-based company has said it plans to boost annual vehicle sales to 7,000 by 2021 from 4,000 now. Through the partnership, Ally will offer retail and lease financing, wholesale financing and remarketing, as well as exclusive programs through the dealerships, Aston Martin said. 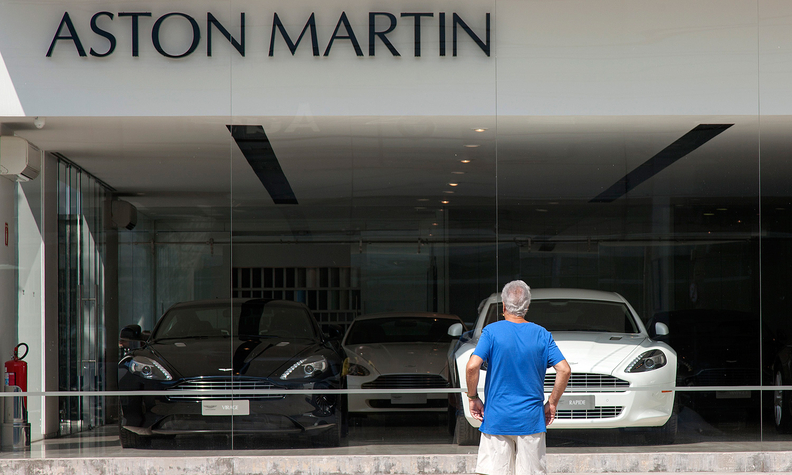 Jenkins said that the U.S. is Aston Martin’s largest retail market, making up about 25 percent of global sales. The automaker said starting monthly lease payments would be less than $2,300 for the four-door Rapide S, $1,900 for the two- door V12 Vantage S and $1,400 for the V8 Vantage. Leases are important for luxury-auto makers, because more of their customers use them. Last month, 55 percent of premium luxury auto transactions in the U.S. were leases, compared with 29 percent overall, according to Edmunds.com. Ally has been seeking to boost revenue by taking on new clients and riskier borrowers after General Motors said it would use its own financing unit. The company announced this week that it will become the preferred lender for Mitsubishi Motors Corp. in the U.S.